For the second oil painting exercise, Cynda Valle will guide you through painting a still life of an apple. Right-click on the picture to save it, then print it (if you have access to a printer) or put it on a computer or tablet for handy reference as you’re painting. We expect that each part in this lesson will take about two hours to complete, though this may vary from student to student depending on your individual pace. Take your time, don’t rush, and if you need to stop you can. If you have more than an hour to spare, then work as long as you feel comfortable! Before you start with paint, you may want to do a light sketch of your apples onto your canvas. The sketch doesn’t need to be perfect–it’s just there to help you remember where your major shapes are. The first step, as always, is to “kill the white”. Remember, this process is meant to tone down the white of the blank canvas. Cynda chooses a transparent version of the brightest color she sees for this step. Make a 1:1 ratio mix of Quinacridone Red and Cadmium Red Light for this and add some of your Neo Megilp medium to it. Brush it lightly on the canvas then, using a rag, wipe over the paint so that you’re left with a stain. At this point, Cynda realizes it’s not quite dark enough for her liking, so she uses the same color to paint generally over the apples again to make them brighter red. Once she has blocked in the apples with the brighter red, Cynda begins to pull out some of the light shapes using a q-tip. By focusing on the shapes of the lighter areas in the reference photo and pulling the paint up with a q-tip in those light areas, she is effectively drawing her apples onto the canvas. This is an easier way to draw accurately–by focusing on negative shapes (the light areas around the apples) rather than the positive spaces (the apples themselves). Cynda says she’s going to “scumble” in some light values in the apple later on–if you forgot what “scumble” means, see our Oil Painting Methods And Techniques lesson for a quick refresher! Cynda decides to tone the canvas in the background with a second, cooler color because of the dramatic temperature shift between the foreground and background. Using Ultramarine Blue, she scrubs the paint in around the apples, being careful to preserve the outline of her apples. She reminds us that the thin paint (usually mixed with Gamsol or solvent) is relatively well-blended, so go ahead and blend that a little so it transitions nicely into the surrounding colors on your canvas. Now that this step is completed, we’ll move on to finding the darkest darks in the reference photo and painting those in. Cynda points out that we shouldn’t assume that the shadow color on the apple will be the same color all over, in fact, it shifts to a more green tone near the top of the apple. First, she mixes up the general shadow color with Transparent Red Earth and Ultramarine Blue with a touch of Quinacridone Red. After she checks her color against her reference photo, she realizes it needs to have a bit more blue in it, so she adds her cool blue, Manganese Blue Hue to the shadow mix and checks again. That color looks like it will work, so she adds some medium to thin the paint down to a glaze consistency. Without the addition of the medium, the paint will be too opaque to work as a glaze. Using the shadow color you just created, paint it on the apple where you see the darkest colors–on the left-hand side, the bottom, and a little on the bottom right. Don’t worry about blending just yet–we’ll get to that later. Now it looks like the shadow color turns red, so Cynda mixes some of her general shadow color with Transparent Red Earth and Quinacridone Red to make a deep red shadow color. Mix some medium into it to make it transparent. Cynda notices that her apple has lost some of its shape (or contour) near the bottom, so she goes in and corrects the shape using a q-tip. At the top of the apple, the shadow turns to a green tone. She cleans off her brush and picks up a little Permanent Green Light with it and adds the paint to the top where she sees the shift in color. Lay the paint in carefully and blend it in just ever so slightly and we’ll move on to the next step! If you don’t have enough time to complete this video and need to stop for the day, we’ve put a convenient stopping point reminder in the video at 11:10. As we continue the painting, we’re still looking for the dark accents. You will notice as you look at your reference photo that shadows still have color in them, so some may tend more towards the green side and some more towards the red. Cynda spots a dark red shadow on the apple and uses pure Quinacridone Red to paint it. After that, Cynda moves to the mid tone of the apple–the basic red of the apple. Again using pure Quinacridone Red, she paints in a line next to her shadow to create a nice, soft transition from the dark to the mid tone areas. Remember that matching paint colors is not an exact science. Do the best you can! If it’s not perfect, that’s fine–we’re not trying to paint a photo-realistic apple here–we are trying to get the impression of the apple. Now let’s move on to the tablecloth under the apples. There are some strong blue shadows there, so Cynda mixes a “muddy” blue with Ultramarine Blue and Transparent Red Earth. She reminds us that when you want to tone down a color or make it darker, you mix it with a color that is across from it on the color wheel. Before she adds in the shadow on the tablecloth, she adds it in a few places on the apple, including the stem of the cut apple. When she starts adding in her shadows under the apples, it’s by sight only–no ruler needed. Instead of using a ruler, hold your arm straight out in front of you and measure the angle with the edge of your paintbrush handle. Keep in mind what it would look like on a clock–maybe 2 o’clock in this instance–and then try to replicate that same line on your canvas. If you need help remembering sighting, see our Drawing Course lesson on Measuring Objects For Your Drawing. You’ll notice as you watch the video that Cynda moves her brush around a lot and while she makes definitive marks, she doesn’t fill in the full shadow all at once. First, she uses the paint to sort of “sketch” where the shadow will be and then she goes back and fills it in. This is helpful so that you can get an accurate rendering of the shadow. Imagine if you filled it all in at once and then decided to change the shape or size–it’s a lot more paint to have to change if it’s all filled in. So try to sketch in the shape of the shadow with your brush first and then once you’re sure it’s accurate, move on and fill it in. Between the two apples is a small triangle of light and the shadow is less intense towards this spot, so Cynda uses her finger to pull a little of her shadow pigment out to lessen the intensity of the shadow in that spot. You can use your finger or a clean, dry brush to do the same thing. Now Cynda is using the same dark color to add in some of the background. You will notice that Cynda doesn’t always “fill in” all the spaces in her painting. This is an artistic choice. By leaving some areas less refined, she is focusing the attention on the most important part of the work–the apple itself. As you paint, continue to look at angles as Cynda is doing to make sure you are painting accurately. She adds a little Manganese Blue Hue to her background to brighten up the blue slightly. She brushes in the paint loosely with the brush then uses a rag to blend and wipe off some of the paint. While the brush is loaded up with blue paint, Cynda is adding it in other places she sees it. As she’s doing this, she notices that her shadow under the apples is off, so using a q-tip, she removes some of the shadow noting that oil paint is very forgiving and a good choice for people who make mistakes (all of us)! Cynda now switches her filbert brush out for a flat brush in order to work on the cut apple. She begins by mixing the green color that runs down the center of the apple. Mixing some Permanent Green Light with Cadmium Yellow and a touch of Titanium White, Cynda comes up with a color that is close to what she’s seeing in her reference photo. She is looking for a color that is the right consistency and value (remember: “value’ refers to dark and light. If you need a refresher on this, see Value And Gesture in our Drawing Course). The color she mixes isn’t quite right, so she changes it a little. This is something that will happen often in your paintings–mixing is not an exact science, so you will more than likely need to revise your color mixes slightly until they look just right! When she mixes the color she wants for the green of the apple’s interior, she blends it out towards the edges of the apple with a q-tip and her finger again. At the bottom of the apple is a slightly green tint on top of the red skin, so she adds a touch of green there. Because it is going on top of still-wet red paint, it changes the tone of green from a sort of lime color to more of an olive color as you’ll notice when she adds a mark in the center of the apple where the seeds are (though she will wait to paint the seeds until later). To mix the color of the flesh of the apple, Cynda is mixing Titanium White with a touch of Permanent Green Light and Cadmium Yellow. She lays this color in on the left side of the cut apple then notices that the color transitions slightly. Back to her palette, Cynda adds more Titanium White, Cadmium Yellow, and just a hint of Transparent Red Earth to her preexisting puddle of paint. Notice how when Cynda applies her paint she’s not making small brushstrokes but instead, trying to paint the area of color with one single brushstroke. Remember that you can turn your brush as Cynda does to be able to fill an entire area with one stroke! This is a great tip for beginning students: use your brush to its full advantages. Square or filbert shaped brushes can go from very thin, straight lines to very full, square or rounded marks depending on the way it is turned. There’s a spot of very light pink near the bottom of the apple, so Cynda adds that. Then she decides she’s getting “too fussy” and since you don’t want to overwork any one area of your painting, it’s time to move on to another area. Getting back to the small triangle of light between the apples, Cynda mixes Titanium White with Manganese Blue Hue and a little Transparent Red Earth. Notice that even though the area she’s painting is very small, she’s still using a fairly large brush. Wipe your brush on your palette to smooth the bristles into a thin chisel-like point in order to add that small shape in between the apples. The same color she mixed up for the triangle is also on the left side of the painting in the background above the apple. She lays that color in around the apple, then decides to lighten it slightly by adding more pure Titanium White over the top of the existing blue she’s just painted. Because both colors are wet, they will mix on the canvas. To add in the light and bright blue-white of the tablecloth, Cynda switches to a larger brush because as she reminds us, “You want the biggest brush for the job” (which, if you’re following our suggestions on the Recommendation List will be either your number 10 filbert or number 12 flat). Continue adding this color where you see it in the tablecloth in the reference photo. Now it’s time to deal with the really bright red part of the apple. Cynda is going to add a glaze on the apple with a clean filbert brush loaded up with Transparent Red Earth and a touch of Cadmium Red Light. In order for the paint to stick to the still-wet paint that’s already there, the paint on top needs to be thicker. Use just a little bit of medium in your paint mixture to make sure it’s thick enough to stick. Now for the brighter areas, Cynda is using Cadmium Red Light. Remember that when you’re trying to brighten a red, use colors that are closer to the orange/yellow side of the color wheel–do not add white! Adding white to red doesn’t brighten it, but dulls it out and makes pink. The brushstroke that Cynda makes may look odd to you, but you’ll see when you look at the reference photo that she’s painting around that dark shadow that’s being cast by the cut apple. Stand back from your painting and look at that diagonal stroke to make sure it’s accurate. Take a moment to gauge your darks–are they dark enough? If not, mix some Quinacridone Red with Transparent Red Earth to make a deep red and add it where the shadows are darkest. Blend the edges between the shadow and mid tone areas using a clean, dry brush (or your finger if you’re like Cynda) and then we’ll move on to the final video to finish up the painting! Cynda is going to focus now on putting in the lightest highlights in the painting. Using pure Titanium White, she is lightening even further the background color behind the whole apple. She notes that the greater the contrast, the more the audience gets a sense of realism and three-dimensionality. Because the shadow on that whole apple is one of the darkest colors in the painting, adding a very light color next to it will intensify the contrast and really make that apple pop or stand out in a nice and realistic way. Cynda even mentions that it’s okay to exaggerate the contrast a bit if you can, “painting is all about life with a little more drama,” she says. Highlights really help finish the painting, but while it’s tempting to add those highlights in during the beginning phases, WAIT. Wait until the end to put in your highlights! One reason is that highlights are often comprised of mostly white, and if we add white in the beginning stages, it will wipe out any chance of getting rich, true darks because as we tinker with the painting and move paint around, the white is sure to get mixed into areas where it shouldn’t be. So have patience and wait until the end stages of your painting to add in your highlights. Even Cynda is excited to get to the highlights, but as an experienced painter, she knows she must be satisfied with the shadows before putting in the highlights. Before she adds her highlight in the whole apple, she pulls out some of her paint with a q-tip to lighten and brighten the color there a little bit. When Cynda does add her highlights, she sees a bit of pink in the highlight of the apple. But there’s no need to mix a pink colored paint because this is oil paint and what’s underneath is wet, which means that when you put something on top of it, it will mix with the paint underneath. Putting pure Titanium White on top of wet red paint will result in the nice pink shade you’re looking for. Just before adding the bright white highlight on the apple, Cynda removes a bit of her red pigment where she notices it’s too strong under where the highlight will go. With a q-tip, she gently pulls a little of the red paint off of the apple, leaving it more of a red-orange color. When you begin with your highlights, make sure your Titanium White is clean. You may need to squeeze a little more out of the tube depending on how much other paint has been incorporated into your existing pile of white paint. Load up your brush with fresh Titanium White and lay it gently on top of your apple where you see the strong highlight. Then move on to the strong whites in the cut apple. Clean your brush to make sure you don’t have any red or pink in your white from your previous brushstroke, then get more pure Titanium White and add it where the brightest highlights are on the cut apple. Next, Cynda adds some green to the whole apple to give it some texture. Using a mixture of Permanent Green Light, a touch of Titanium White, Cadmium Yellow, and Transparent Red Earth (to tone it down slightly), she makes quick strokes to indicate the streaks of green in the apple in the reference photo. She blends it slightly with her fingertip. You can see how this instantly adds depth and character to the apple. Cynda is adding highlights now to the tablecloth. Again, she’s using pure Titanium White in selective areas to add depth to the cloth. She softens the transition between the light and dark areas in the background just slightly, then voila! The painting is finished. How did your apple turn out? 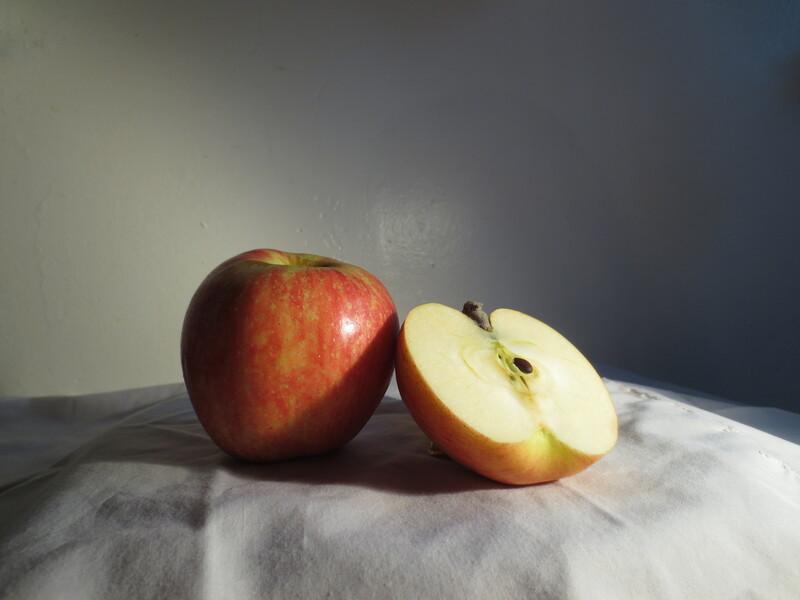 Send us a photo of your apple still life using our submission form here.